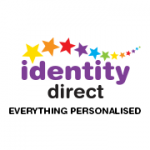 Identity Direct is a world-leading supplier of personalised gifts, school supplies and labels. They design and create personalised gifts for Kids, Mums and Dads who want something special! They personalise lunch bags, back packs, swim bags, drink bottles, towels, pencils, school essentials, gifts for the home and much, much more. Plus our huge range of practical labels in various shapes sizes and designs ensure that you keep track of everything.